I can’t help feeling sad for Leeds Assembly Rooms. 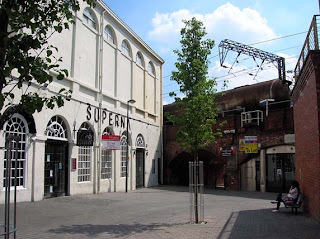 In the late 18th century it was a glorious venue where balls and card parties were held for prosperous merchant families, now it’s the site of restaurant chains and nightclubs and feels slightly down-at-heel. The railway – which was extended through the town in 1865 – really destroyed the original grandeur of the building, though attempts have been made to jazz up the area (known as the Exchange Quarter) as a destination for urban professionals. 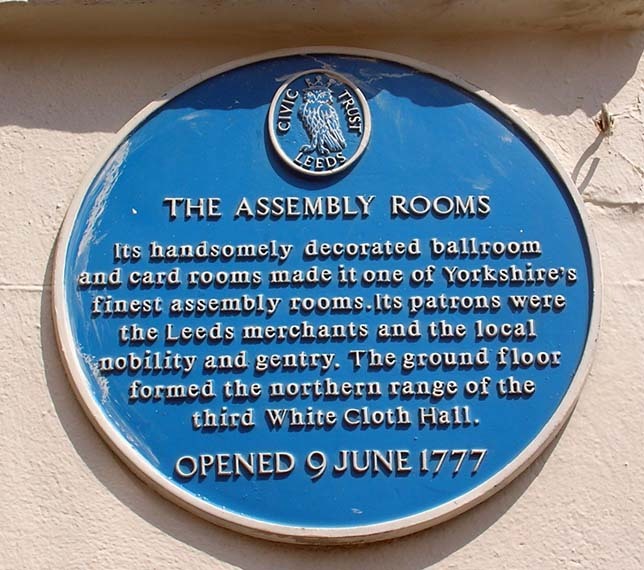 The life of the “New” Assembly Rooms began in 1777, when Sir George Savile and Lady Effingham launched them above the third white cloth hall. 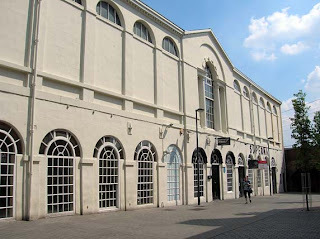 Thanks to some sensitive restoration you can still see the front of this building (right, now occupied by Pizza Express). 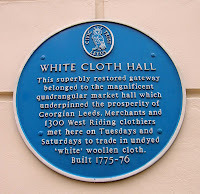 It was planned by wealthy Leeds merchants – spurred on by the opening of a rival cloth hall at Gomersal – and built on the Tenter Ground in the Calls. 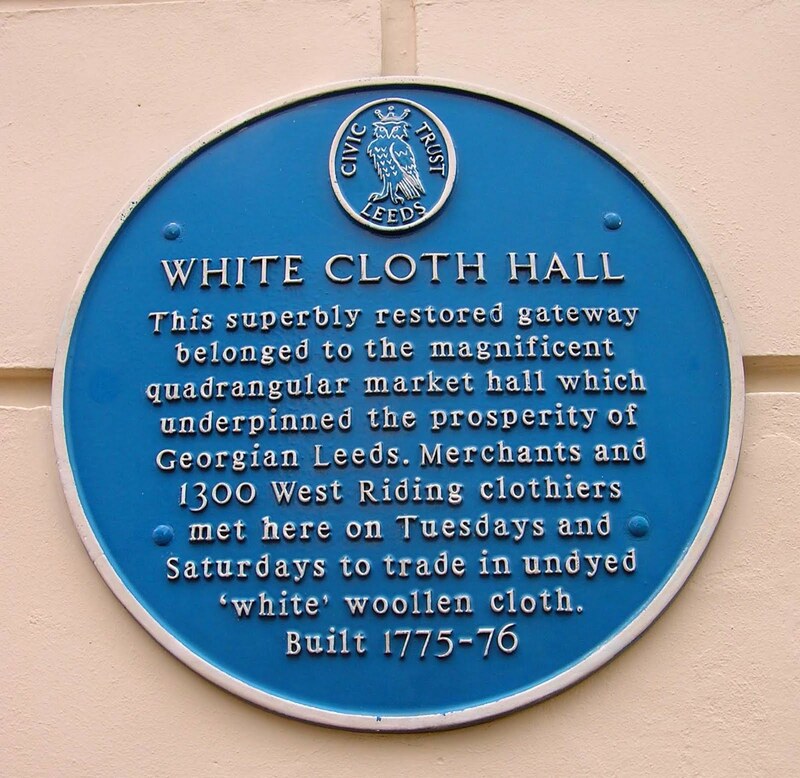 As the name suggests, the white cloth hall sold undyed cloth, whereas the mixed or coloured cloth-makers used the market in Briggate. 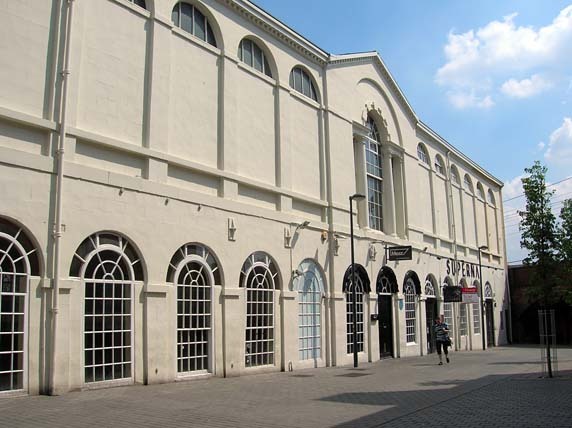 It was constructed around a large central courtyard and it was two storeys high at the northern end (as mentioned, The Assembly Rooms were on the second floor). Big public events were sometimes staged in the courtyard, such as Mr Lunardi’s balloon ascent in 1786. The cupola you can see in my photograph, above, actually came from the second white cloth hall, and was installed in 1786, when that building was demolished. The third white cloth hall was restored in 1991, and it was at this time that a small bell was put into the cupola (it’s struck by an internal electric clock hammer, though rarely sounds now). With the coming of the railway in 1865, they actually had to build a fourth white cloth hall (though the North Eastern Railway company did foot the bill for it). You can see in my photograph below how the North Eastern Viaduct literally sliced the New Assembly Rooms in half. Ironically this fourth hall was never fully used, and was demolished in 1895, though the building that now stands in its place (a hotel) also sports the original cupola, carefully preserved for posterity. 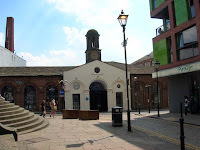 I was fortunate enough to visit Leeds a few years ago (spending much of my time at the castle and not the town). I have to say, I had the BEST Lemon Cake I have ever had in my life at the little cafe in the castle gardens. I even mentioned it in an article I wrote for a travel magazine. I've enjoyed your series on Leeds, Mrs. Woff. You've managed to track down some intriguing Georgian gems to polish in a city which – I’m afraid – fails to inspire me to further adventures in urban Yorkshire. Thanks Anonymous, well it was only my first visit, so I haven't yet got the measure of Leeds, but I did like the whole canal area which was not unlike Brindleyplace in Birmingham.